As CEO Artur Bergman recently noted, Fastly now serves over 10% of all internet requests, which gives us unique insight into how groups engage online. As part of our mission to serve the best of the internet, we’re honored to offer complimentary CDN services to nonprofits, including One America Appeal, Direct Relief, Reporters Without Borders, Khan Academy, and more. Late summer and fall of 2017 marked a devastating season of natural disasters: Hurricanes Harvey, Irma, and Maria left paths of destruction in August and September, Mexico City was hit with two major earthquakes the last week of September, Northern California was inundated with wildfires in mid October, and the Thomas Fire began to ravage Southern California the first week of December. We analyzed traffic to nonprofit sites and came up with some heartening results: people continued to give throughout the fall, with several major spikes of engagement. Read on to see how people engaged (and gave) in 2017, with a closer look at traffic to customers One America and Direct Relief. Note: In order to determine the baseline, we calculated average traffic for three normal traffic days before major events occurred. All times are in Pacific Standard Time. One America Appeal was launched by the five living former U.S. presidents on September 7, 2017 to help Texas, Florida and the Caribbean recover from the catastrophic hurricane season. To date, they’ve raised $40 million in tax-deductible, private funds from over 80,000 donors. 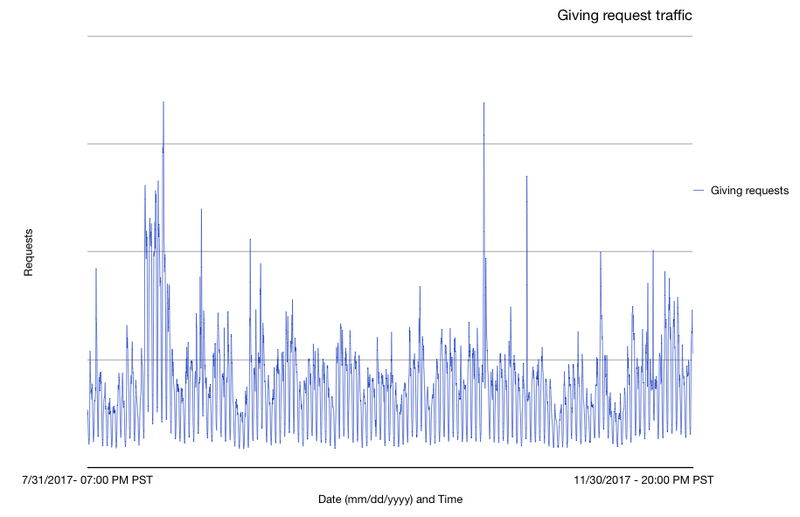 We’re honored to provide them with complimentary CDN services as part of our Open Source and Nonprofit Program, and have worked with them to share their top moments of giving from the fall of 2017. After the governor of Puerto Rico declared that the island was on the brink of a humanitarian crisis, traffic to oneamericaappeal.org climbed abruptly to 5,509% above average on 9/26 as people rushed to give. On October 21, One America hosted a concert at Texas A&M’s Reed Arena to benefit hurricane victims. Those unable to attend could live-stream the event from the YouTube link embedded on their homepage; as a result oneamericaappeal.org saw a massive increase in traffic: as soon as the concert began at 7 PM CST, traffic jumped to 14,902% above average. Direct Relief is a humanitarian aid organization, active in all 50 states and more than 80 countries, with a mission to improve the health and lives of people affected by poverty or emergencies. In November alone, they received $105 million in medical aid, 473 thousand pounds of medicine and supplies, and supported 560 clinics and health centers. On October 5, Chance The Rapper hosted a benefit concert, and linked to directrelief.org from his homepage the day prior. As a result, their site saw increased engagement, with requests climbing 4,943% above average at 9pm PT. The latter half of 2017 had more than its fair share of natural disasters, but we were heartened to learn how people gave and engaged in the wake of these terrible events. People were not fatigued by constant calls to action, but rather continued to offer aid and relief consistently — with several increased moments of engagement — throughout the fall. Traffic to nonprofit sites was already elevated in the early hours of what was then Tropical Storm Harvey, climbing to 584% above baseline on 8/17. Traffic spiked again on 8/25 at 6pm, 384% above baseline as Hurricanes Harvey and Irma raged on. On 10/26 at 7pm, traffic climbed to 583% higher than average, as disaster relief efforts for the Northern California wildfires were in full effect. The Thomas Fire in Southern California was reported on 12/4, and we saw subsequent engagement: as of noon on 12/5, traffic was 267% above baseline, and — at the time of writing — remains high. Stay tuned — we’ll continue to share real-time insights into how people engage with major events online in 2018 (and beyond).